Today is the Quidditch Tournament in our school. A few years ago, I wrote a song to celebrate our game and last week, I updated it, using a music loop software for the music. Then, I made a music video. Yesterday, I had all of my students listen to it and I had all 80 of them help me sing the chorus. Yeah — it was messy, but messy fun. Today, I am out of my classroom in order to visit a local college just a few communities over. 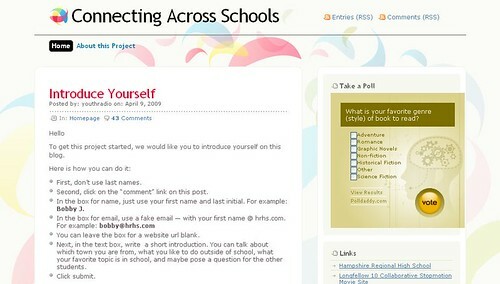 I am scheduled to give a few presentations to prospective teachers on the merits of Digital Storytelling. It’s quite an honor to be asked (and my principal deserves kudos for giving me the quick green light to accept the offer), and there is the added bonus that I am presenting at the same college where I attended my own teaching certificate program that led me to where I am now (after 10 years as a newspaper reporter and then two years staying at home as a dad). I wish we were in a computer lab today because my presentation, of course, has us building a digital story project, but I guess we will do it as a class collaboration. The theme of the digital story we will build is “Beyond the Curriculum” and the idea is to talk about all the other learning that goes on in schools beyond the set curriculum. Maybe I am thinking of this because our Quidditch Tournament is just a few days away, but as I was looking through my classroom photo files, it became clear that kids are learning in all sorts of ways and not just seated at their desks. I’ll be showing the prospective teachers Photostory3 and then Voicethread — if time allows. I blogged a few weeks about the movie that my son was making. Well, I helped him finish it this weekend and it is a hoot. It is all about an imaginary creature called The Squop that first allegedly eats our cat and then our youngest son. He even wrote lyrics to a song based on We Three Kings for his cast of animated Pea Detectives that we all sang. Meanwhile, we decided to set up a blog for him to showcase the movies he has been making. Check out Crazy Cartoonz. Next year, my students leave the comfy confines of our elementary school to attend the big regional middle/high school. For some, this transition causes much worry and concern. They wonder about lockers, about bullies, about the food, about getting lost in the building, and more. (Funny — it’s the same worries I had when I was going into middle school). Last year, a teacher at the high school and I talked about finding some ways to use technology to allow my students to ask his older students questions about the transition to the bigger school and connect them together some way. We are both teachers in the Western Massachusetts Writing Project network, which made our collaboration all the more easier to get moving along. This week, we got the project off the ground. We’re using a WordPress blog and his tenth graders began some introductions, and then my sixth graders did some responding and questioning (such as, in which class do you dissect the rat?). We’re hopeful this blog will help ease the transition, but also open up doors for more collaboration among them as writers. I know my pal, George Mayo, is about to launch the SPACE online magazine again this year (see last year’s version), focusing in on poetry and multimedia verse, and I can see using our shared blog space for some collaboration and review before publication. It’s exciting to be using technology not just for global projects, but also for local projects. And I had a great time remembering many of my former students who are now in that tenth grade classroom, remembering their sixth grade year. 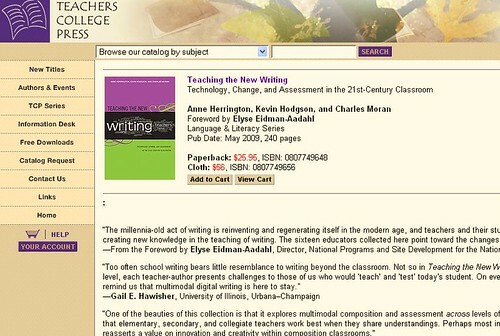 It’s been a long, long road but the book collection on writing with technology, and assessment, is about to be put out by Teachers College Press. I am a co-editor with two esteemed colleagues — both well-respected college professors (one now retired) in the field of literacy — and also I am a writer of one of the chapters (on digital picture books). The book collection, due out in May but now advertised in TCP materials, is called Teaching the New Writing: Technology, Change and Assessment in the 21st Century Classroom. It was about 2 1/2 years ago that they approached me about the idea of the book collection and that began an interesting adventure of seeking contributors, weeding through submissions, editing and proofreading, and writing, of course. Our hope is that the book provides some focus for how to not only institute technology into a writing curriculum, but also, how one can balance the creativity of student work with state assessments (not easily, we conclude). I’ll write more when the publishing date is upon us.